RMP were commissioned to provide consultancy services for the Bath Street residential development including acoustic design advice, sound insulation and air tightness testing. Designed by John Kinsley Architects, the scheme is a collective build for four separate families. 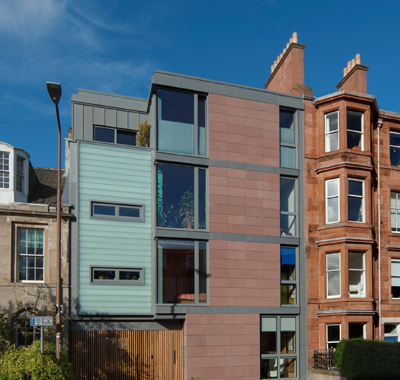 The format of the building follows the traditional Scottish tenement model with a central shared stair providing access to all the flats and access to a shared garden on the roof. The build adopted a ‘shell and core’ approach, meaning that, while the design and construction work was completed by professionals, much of the interior finishing was left for the individual owners. This meant each family was able to buy at cost and have greater scope for personalisation. The building is designed to Passivhaus-equivalent levels of energy efficiency and uses a cross-laminated timber structural frame allowing it to be erected in only nine days. The growth of timber for the frame absorbed 114 tonnes of carbon – an average UK resident’s emissions for approximately 12 years. The high levels of insulation mean that the families have not needed to install a central heating system and all electricity is generated via on-site photovoltaic panels or procured from 100% renewable energy; the building is completely fossil-fuel free.